Endemic, emerging and re-emerging viral pathogens are a significant cause of morbidity and mortality in both human and animal populations globally. A few examples of these include MERS CoV, HIV, Ebola, H1N1, seasonal Flu, Rift-valley fever, dengue and Respiratory Syncial Virus. Considerable virus research work goes on in Kenya and in the East African region but there has been a paucity of opportunities for scientists in the region to come together, discuss research output and forge new research questions, networks and collaborations. The Medical and Veterinary Virus Research (MVVR) an initiative of virus research leaders working in Kenya on important viral infections both in humans and animals that brought together virology scientists around Kenya and the East Africa region to showcase their research over a two-day period . The last MVVR-3 meeting brought together over 130 researchers from Kenya, Uganda and Tanzania working in various fields of human and animal virus research. 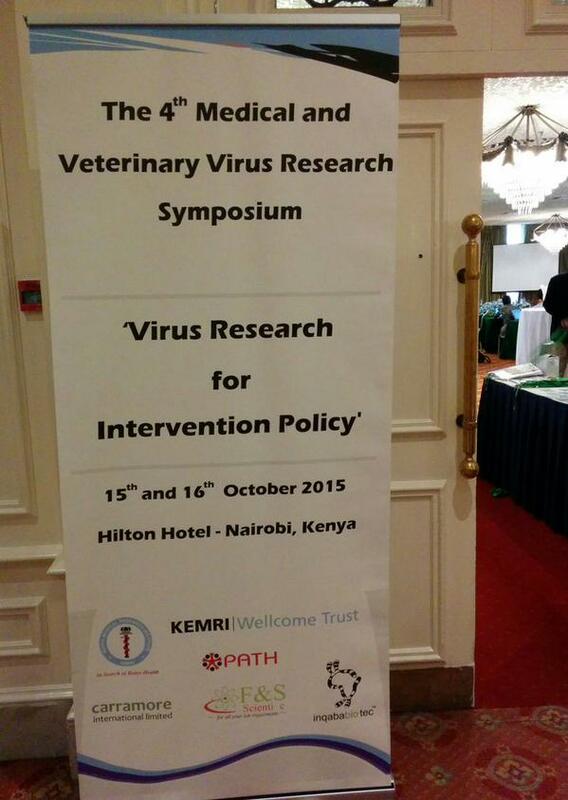 The MVVR-4 was held on the 15-16th October, 2015, guided by the theme, “Virus Research for Intervention Policy”. The primary objective of MVVR-4 is to showcase virology research in Kenya and the East and Central Africa region. To provided a platform for like-minded professionals to share and discuss research findings as well as encourage cooperative research on emerging viral infections that pose significant threat to human and animal welfare. Particularly keen to encourage early stage scientists to present their work and thus offer them both a training ground and opportunity to network and develop collaborations. Our group was represented in by Prof. Eric Fevre, who presented our recent collaborative paper on MERS CoV in Kenya. Our first research output on this topic will be available from next week, follow us on twitter and also do come back to our blog page for updates. One of our key research output will be available as from next week, follow us on twitter and also constantly view our blog page for updates.